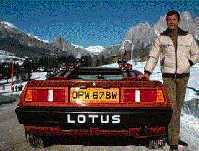 The Lotus Esprit became Moore's car, just as the Aston Martin had become Connery's. Featured in The Spy Who Loves Me and For Your Eyes Only, it was nicknamed "Wet Nellie" after "Little Nellie" of You Only Live Twice. While at first the car seemed to be only a land vehicle, it was quickly revealed to be a fully functional submarine as well. The car also had all of Q's usual accessories including surface-to-air missiles, depth charges, underwater smoke screens, and torpedoes. The car survived its first adventure, but fell victim to destruction in For Your Eyes Only. After that, Q equipped Bond with yet another Lotus, this time a red one which Ferrara was killed in.